As I'm sure most of you have heard, Japan is facing a possible nuclear crisis after having suffered a 9.0 earthquake and a tsunami. I have been following the news closely, and I am grieved by the horror of the situation. I have a friend in Yokohama, and this has made it all seem very real. God is capable of stopping the spread of radiation. God is bigger than this disaster. Because I believe this, I am issuing a call to prayer - for the Japanese people, for the workers in the Fukushima Daiichi Power Plant, for the wildlife that perhaps is now being affected as radioactive steam blows out to sea, for those in Russia who are terrified that radiation will spread to them. Pray that God would stop the spread of radioactive particles. Pray that the workers at the plant would be able to get the cooling situation in the reactors under control. Pray for God's mercy. Most of all, pray that His will would be done - since we know that His will is always best, even when we don't understand it. 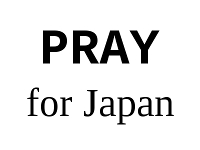 I made a very simple button to share this call to prayer. If you agree with me, please grab it for your sidebar or for a post and pass it on so more people will pray. If we do this, there will be no counting the number of people praying for this situation. If you haven't seen much news on the situation in Japan, I recommend the New York Times coverage, which has been moderate and helpful.